Socialbakers is aiming for a new industry standard for customer care which it calls 'Socially Devoted' and inviting discussions to improve customer response rates and times across the industry. Socialbakers launched its manifest yesterday at Leweb London. It is aiming for a new industry standard for customer care which it calls 'Socially Devoted'. It is inviting a discussion amongst brands which is intended to move the standard forward and improve customer response rates and times across the industry. Socially Devoted currently has a focus on Facebook brand pages but the behaviour should apply to response times across all social platforms. Jan Rezob, CEO of Socialbakers launched the manifest and quoted some statistics about brand behaviour on Facebook. The average response time for companies to respond to customer questions on Facebook is 26 hours Although 80 per cent of companies are using social media, only 30 per cent are doing it correctly. 70 per cent of questions that companies receive on social media channels are not responded to. These companies are effectively ignoring their customers. 25 per cent of global companies have a closed wall on Facebook. This includes brands such as Disney, Skype, BA, Microsoft Xbox and McDonalds. Disney, probably has a closed wall to prevent interaction amongst adults and children that are not in their own family but other brands should ask themselves why they have a presence on Facebook but do not engage with their fans. Being both socially reactive and proactive with customer interaction results in “social 2.0” Rezob said. Brands should devote time and energy to their fans and friends and avoid the costs of not being social. Rezob had some suggestions for companies that wanted to become “socially devoted”. Brands should open their company Facebook wall, respond to at least 65 per cent of questions and communications in a timely way. He admitted however that Socialbakers itself currently responds to only 50 per cent of the questions it is asked. Lots of companies make good effort to respond to customer questions, either with a short response time, or a good response rate. 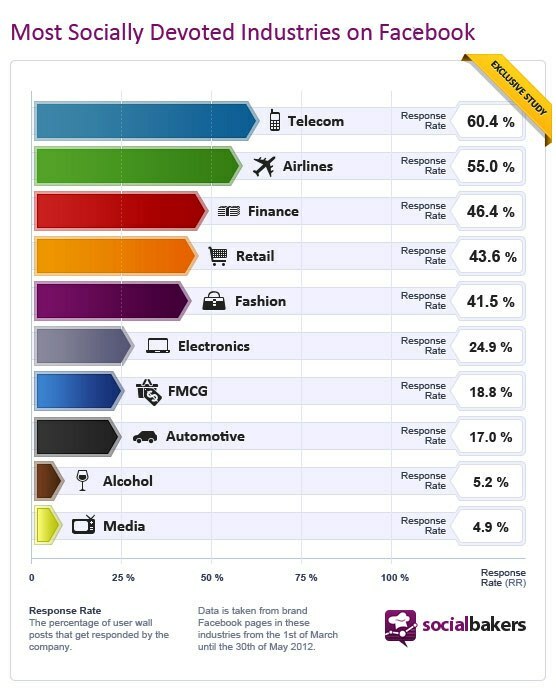 But there are brands highlighted at the bottom of the charts that have very poor responses to customers. EBay responds to only 4.80 per cent of its social media questions on Facebook. Blackberry is worse, responding to 4.12 per cent of customer questions. But at least they respond to some questions from their customers. Across the automobile industry, companies answer only 17 per cent of questions posed on Facebook. Both Ferrari and Mercedes-Benz do not answer any of their customer questions, despite having almost 8.5 and 7.5 million fans respectively. Other industries, notably finance also ignore questions from their customers. These brands do not respond to customer questions at all. Perhaps brands with low response rates or long response times should look at the leaders to try and improve their own customer response programs. South America scores best across brand response times with lots of Latin America brands at the top of the socially devoted leader board. KLM should be congratulated for its social media response time. It has an average response time of 27 minutes and responds to 94.14 per cent of questions. In the time sensitive world of tight flight schedules, this response time is impressive. Mobile operators also seem to understand the value of social engagement. The mobile operator Claro in Guatemala responds to its customer questions within 21 minutes and responds to 96.99 per cent of customer questions. Vodafone Nederland responds to customer questions with an average time of 65 minutes and a 92.27 per cent response time. Personal Argentina, Communidad Movistar Argentina and Safaricom Kenya all have close to a 90 per cent response rate. That the company is "open”. The company has set up its official networks as a net for working with its customers; it has all the means set up in order for fans to communicate on these networks, (opening Facebook walls for example). That the company responds to questions from its fans. The company has to respond to as many of its fan questions as possible. We say at least 65 per cent of all questions should be responded to. The industry benchmark to date is 30 per cent. That the company responds on time. Running a customer care site and not responding in time means that a message won't get to your fans in time for them to even notice. The current industry benchmark is over one day, but in real life, companies should be aiming at 10 - 30 minutes. Depending on the nature of the service, consider 24/7 support”. The industry benchmark for the automobile industry is currently at an average of 21 days to respond to customer questions. This poor customer response time falls far short of the definition of a 'social' brand driving satisfactory engagement with their fans. Some brands still have rather a long way to go.